The Lesser Masked Weaver (Ploceus intermedius) is a common and widespread in much of southern Africa, including the following countries: Angola, Botswana, Central African Republic, Republic of the Congo, Democratic Republic of the Congo, Djibouti, Ethiopia, Kenya, Malawi, Mozambique, Namibia, Rwanda, Somalia, South Africa, Sudan, Swaziland, Tanzania, Uganda, Zambia, and Zimbabwe. They generally prefer open or semi-open habitats, woodland or forest along rivers, thornvelds, particularly near water. They have also established themselves in towns and villages, where they inhabit parks and gardens. These are large, noisy, gregarious birds that are typically found in large colonies. The Lesser Masked Weaver measures about 6 - 7 inches (15-17cm) in length (including its tail). It has a strong conical bill. The breeding male has a black head and bill and chestnut nape. The upper plumage and wings are yellow and black, and the under plumage is yellow. The non-breeding male has a yellow head with an olive crown, grey upper plumage and whitish under plumage. The wings remain yellow and black. The adult female has streaked olive upper plumage, yellow and black wings, and pale yellow under plumage. Juveniles look like females but are browner on the back. Similar Species: They look similar to the Southern Masked Weaver, but the males can be identified by the lighter eyes. The male Southern Masked Weaver has reddish eyes. The breeding season usually stretches from September through October and from January through February. Lesser Masked Weavers are territorial colonial nesters, with colonies of about 10-300 breeding males. Males will mate with up to 5 females (average 2) per breeding season. The nest is usually woven from green strips of reeds, grass leaves or palm blades and once completed is a round structure with a large entrance on the underside. After completion of the nests, the male will defend his small territory around his nests, displaying to the females, attracting their attention to his nests. If accepted by the female, he will add a short entrance tunnel, while the female lines the interior with soft grass heads and feathers. The female usually lays between 2-5 eggs, which are incubated only by the female for about 12 days. The male assists in feeding the chicks. They young fledge the nest when they are about 17 to 21 days old. 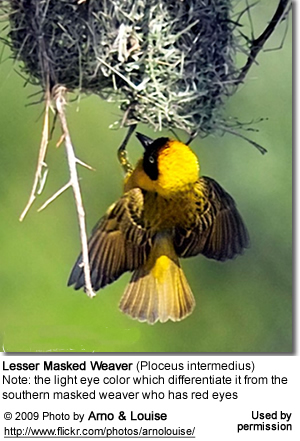 Lesser Masked Weavers mostly eat insects, such as Coleoptera (beetles) m termite alates, ants and locusts (Orthoptera), gleaning them from the ground and foliage and catching termite alates in mid-air ("hawking"). The percentage of insects in their diet increases during the breeding season, especially when feeding young. They also feed on nectar, from plants such as Aloe barberae (Eastern tree aloe), Aloe ferox (Bitter aloe), Erythrina caffra (Coast coral-tree), Erythrina latissima (Broad-leaved coral-tree) and Schotia (boer-beans). 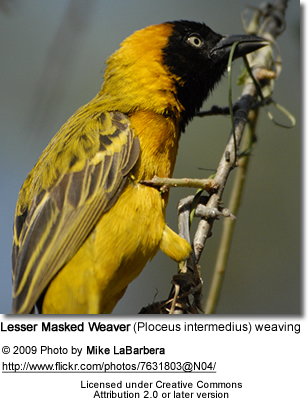 Lesser Masked Weaver also feed on seeds and grain, and in some areas are considered crop pests. They will also take advantage of human offferings, readily accepting picnic table scraps. The calls of this bird include harsh buzzes and chattering. 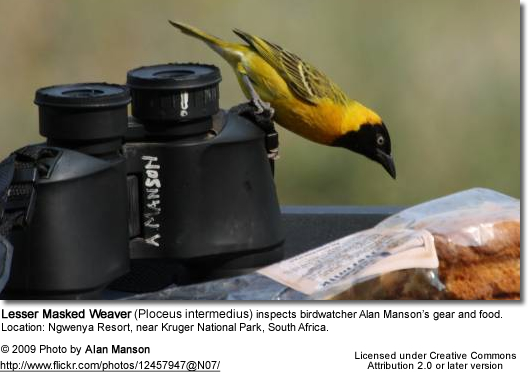 Lesser Masked Weavers are preyed upon by various birds of prey, such as Little Sparrowhawks, Africn Harrier-hawks, Gabar Goshawks; as well as Purple Herons and Pied Crows. Snakes, such as Dispholidus typus (Boomslang) and the Python sebae (African rock python) will mostly prey on their eggs and the young, but will also take adults roosting in their nests.